Tell us a tip or recipe you’ve learnt from her OR upload a pic of the two of you and you’re in! You’ll be in the running to win a professional photo shoot for the two of you with one of Australia’s leading photographers (including hair and makeup for the shoot, lunch and transport costs). A memory to last a lifetime! 1. Information on how to enter forms part of the terms of entry. Entry into the competition is deemed acceptance of these terms and conditions. The winner is determined by a judge. 2. Entry is open to all residents of Australia. However, employees and their immediate families of 1 Million Women and their associated agencies and companies are not eligible to enter. 3. The competition commences on April 11th 2014 at 00.05 (AEDST) and concludes on May 13th 2014 at 13:59 (AEDST). 4. 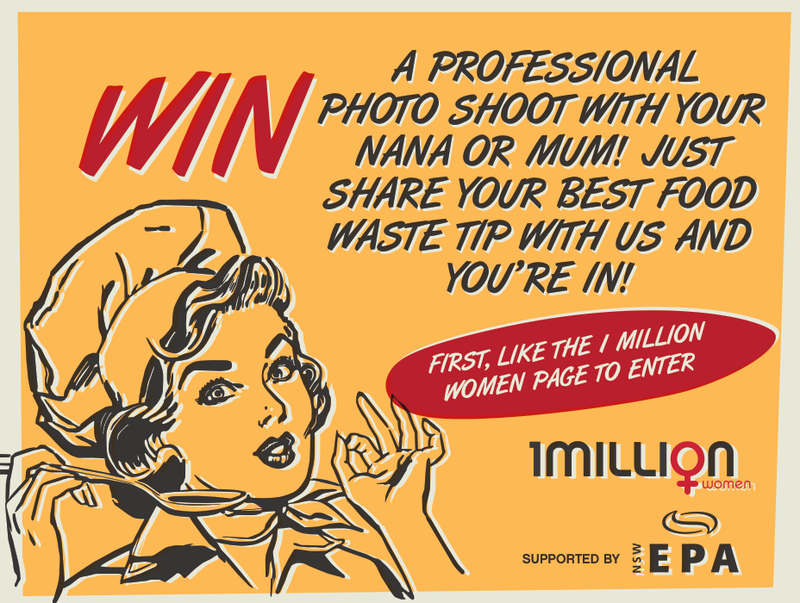 To enter, participants are to respond to a Facebook promotion where they need to ‘Like’ the 1 Million Women’s Facebook Page to unlock the entry form and register their details including (but not limited to) name, post code, e-mail address, a tip or recipe from their nan (or older wise lady) or upload a photo. 5. Entrants under the age of 18 must obtain the permission of a parent or guardian over the age of 18 to accept the prize should they win. 6. Entrants (including winners) in the competition may only enter once during the course of the promotion. 7. The Promoter reserves the right to request winners to provide proof of identity, proof of residency at the nominated prize delivery address and/or proof of entry validity in order to claim a prize. Proof of identification, residency and entry considered suitable for verification is at the discretion of the Promoter. In the event that a winner cannot provide suitable proof, the winner will forfeit the prize in whole and no substitute will be offered. 8. The Promoter reserves the right to verify the validity of entries and to disqualify any entry which, in the opinion of Promoter, includes objectionable content, profanity, potentially insulting, inflammatory or defamatory statements, disqualify any entrant who tampers with the entry process, who submits an entry that is not in accordance with these Terms & Conditions of Entry or who has, in the opinion of Promoter, engaged in conduct in entering the Promotion which is fraudulent, misleading, deceptive or generally damaging to the goodwill or reputation of the Promotion and/or Promoter. The Promoter reserves the right to disqualify a winner if Promoter becomes aware that the winner and/or the winner’s entry is of a type described in this clause. 9. One prize winner will be announced each week. Entries for the first week winner must be received by 13:59 (AEDST) on April 18th 2014 to be valid for entry into the first week judging. Entries for the 2nd week winner must be received by 13:59 (AEDST) on April 25th 2014 to be valid for entry into the second week judging. Entries for the third week winner must be received by 13:59 (AEDST) on 2nd May 204 to be valid for entry into the third week judging. Entries for the fourth week 2x winners must be received by 13:59 (AEDST) on 12th May 2014 to be valid for entry into the fourth week judging. The time of entry will in each case be the time the entry is received by the website database. The Promoter accepts no responsibility for any late, lost or misdirected entries not received by the Promoter or delays in the delivery due to technical disruptions, network congestion or for any other reason. 10. Each prize winner will receive entry to a styled photo shoot with renowned photographer Andreas Smetana for themselves and their nan (or older wise lady). Prize winners and their nan (or older wise lady) from outside Sydney, Australia will be transported to the styled photo shoot in Sydney, Australia. 11.The promoter will not be responsible for costs other than transportation of the prize winner and their nan (or older wise lady) from the winners’ home address within Australia, to the location of the photo shoot in Sydney, Australia. 12.The prize winner for week one will be announced 22nd April 14:00 (AEST) and notified on the day of announcement. The prize winner for week two will be announced 28th April 14:00 (AEST) and notified on the day of announcement. The prize winner for week three will be announced 5th May 14:00 (AEST) and notified on the day of announcement. The two prize winners for week four will be announced 16th May 14:00 (AEST) and notified on the day of announcement. 13. Prizes cannot be transferred or redeemed for cash. 14. The details of reclaiming the prize will be referred when the winner is notified. 15. If the winner is under the age of 18 as at the date of the winner being determined, an adult must accompany the minor in the participation of the prize. 19. In consideration for the Promoter awarding the prize to the winner, the winner hereby assigns to the Promoter all right, title and interest in and to all copyright in any material created pursuant to the winner’s participation in any aspect of the prize (Works). The winner acknowledges that the Promoter is free to use the Works and to exercise its rights in relation thereto and the winner will not be entitled to any fee for such use. 20. In consideration for the Promoter awarding the prize to the winner, the winner hereby permits the winner’s image and/or voice, as recorded, photographed or filmed during the winner’s participation in the prize to appear in connection with advertising or marketing thereof, in any media whatsoever throughout the world and the winner will not be entitled to any fee for such use. 22. The winners will be decided by a judge from all entries received throughout the duration of the promotional period by 1 Million Women Campaign, 23 Playfair St, The Rocks, NSW, 2000. 24. The winner will be notified via their registered email and published online on the 1 Million Women Facebook page and other social media streams. 25. Prizes will only be awarded to the account holder of the entry mechanism used to submit their entry. The winner will therefore be the account holder.